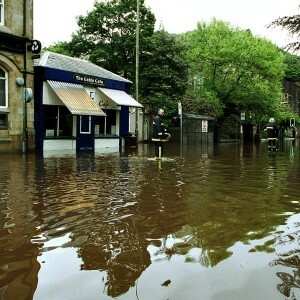 Climate Change is a major threat to Calderdale. It is with us now and its impact will increase in the future. The floods of 2012 that devastated communities in the Upper Calder Valley an early warning of the more extreme weather that’s forecast to come. How we should respond is set out in Calderdale’s Energy Future, the Council’s pioneering strategy prepared in partnership for the whole district. Its target is to achieve a 40% reduction in CO2 emissions by 2020 from a 2005 baseline. But we must also increase our ‘flooding resilience’ by managing river flows and planting trees across the Calder catchment, from the moors to the river channel. Pennine Community Power – a Community Benefit Society founded with the aim of generating renewable energy within the Upper Calder Valley and distributing the profits to fund further local sustainability projects.